The Carver is a tilting three-wheeled vehicle using an automatic balancing technology to balance the passenger compartment under all conditions. The first commercial Carver product, the Carver One, was designed to seat two people, and manufactured and distributed by Carver Europe (formerly named Vandenbrink) in the Netherlands. In June 2009 Carver Europe declared bankruptcy due to lack of demand at its 30,000 euro price, and ceased commercial production and sales. As of 2011, the technology is owned and licensed by Carver Technology. The Carver vehicle combines aspects of a motorcycle and a car, both in appearance and design. Like many microcars, the Carver has three wheels and the controls of a normal car. 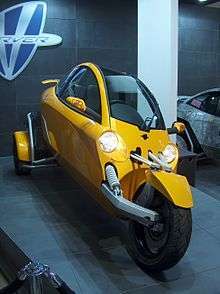 The three-wheel Carver One is said to have the comfort, controls and stability of a normal car while showing the dynamic cornering behaviour of a motorcycle. The Carver can be driven by anyone with a normal car driver's license in the European Union, though other countries outside of the EU may not allow this. In most countries the taxation follows the motorcycle guidelines. The dimensions are 3.4 m (11 ft) long by 1.3 m (4.3 ft) wide by 1.4 m (4.6 ft) high, giving it a low slim profile, similar to a motorcycle. It weighs 640 kg (1,410 lb), about half the weight of a medium size car or three to four times the weight of most motorcycles. The Carver One can tilt up to 45 degrees while turning. This is not based on how far the wheel is rotated, but on how much cornering force is applied to it. The Carver has a 660 cc 4-cylinder 16-valve engine with a turbo intercooler giving a power output of 65 bhp (48 kW) at 7,500 rpm and a maximum torque of 100 N·m (74 lb·ft) at 4,000 rpm. An option is available to upgrade the ECU to give 85 bhp (63 kW) output (this option was never released). The transmission is a 5-speed manual with reverse, and all wheels are equipped with ventilated disk brakes. The front wheel is slightly larger than the rear wheels (at 17" to 15"). The Carver One, as standard, has a top speed of 185 km/h (115 mph). The acceleration of 0–100 km/h in 8.2 seconds (0 to 60 mph in 8 seconds), is slow compared to most motorcycles. The Carver One was assembled in Germany by ACÜ and officially launched at the Geneva Motor Show on 7 March 2007. The unique property of the Carver One is its automatic balancing "Dynamic Vehicle Control" system, which is said to allow full stability under almost all circumstances. Thanks to this DVC technology its cornering behaviour is said to feel natural and pleasant. 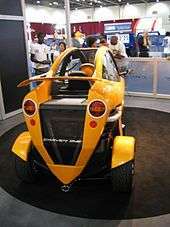 In 2007 it was announced that a California company called Venture Vehicles would be producing the VentureOne, a vehicle using Carver's DVC system. The VentureOne was to be produced in three models: the e50 hybrid, the Q100 high performance hybrid, and the EV all electric. In December 2008 Venture Vehicles was renamed Persu Mobility. Persu Mobility continued to hold an exclusive license in North America to produce vehicles using the DVC system and began pre-registration for a vehicle with an internal combustion engine called the Persu V3, to be available in 2014. Persu has also planned future production of a plug-in hybrid. The DVC system also is licensed to PAL-V who are developing a full-fledged flying and driving vehicle. The DVC system has been demonstrated on a self-balancing ATV. The PAL-V (Personal Air and Land Vehicle) is an autogyro developed from the Carver. It made its first flight in April 2012. The Carver One has been reviewed by various celebreties in various shows: In 2002 journalists Karl Tsigdinos and Conor Feehan got the chance to pilot the original Carver One on the ITV motoring program Drive!. On BBC's Top Gear programme in 2002, Jeremy Clarkson said, "I have to say, absolute hand on heart, I’ve never had so much fun in a car, really and truthfully, and I don’t think I’d ever tire of it." Shortly thereafter the Carver One also featured in a special video of Jeremy Clarkson called "Shoot-out." He announced the vehicle to be "the most fun you can have." Jenson Button tested the Carver One in 2004. ↑ Driving.ca - It's a bike, it's a car, it's a ... Carver? ↑ Venture Becomes Persu Mobility Archived March 30, 2012, at the Wayback Machine. ↑ Quick, Darren. "PAL-V flying car makes successful first test flight" GizMag, 2 April 2012. Retrieved 4 April 2012. ↑ Flying car makes maiden voyage (57 pictures) Washington Post, 3 April 2012. Retrieved 4 April 2012. ↑ "Series 2, Episode 9". Top Gear. Series 2. Episode 9. 13 July 2003. 40:24 minutes in. BBC Two. I have to say, absolute hand on heart, I’ve never had so much fun in a car, really and truthfully, and I don’t think I’d ever tire of it. Wikimedia Commons has media related to Carver One.